Following US Highway 395 along the eastern slope of California’s Sierra Nevada is not a one-time trip; it is one of those experiences you repeat, time and again. It is a place that changes your state of mind. It’s a magical area with amazing vistas, natural mysteries, and stories about the human condition you just have to hear. Every trip is a photographer’s joy; each mile brings a different sight, sometimes raw desert, sometimes sheer mountains that overpower the sky, sometimes delicate wildflowers or a spectacular fall color display. 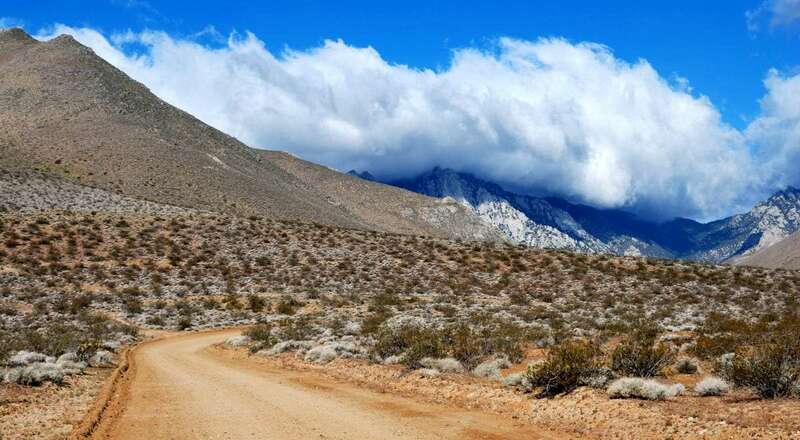 And if you are going to the Bristlecone Forest–and you take the cutoff in Big Pine and miss out on visiting the town of Bishop–kick yourself, reverse direction, and head back to Erick Schat’s Bakkery. When you do, you’ll know why. Buy anything. Get a sweet baked brunch treat and let them build you a sandwich for a picnic later. Don’t miss out! This place is a national treasure. Highway 395 is the main road for the entire eastern slope of California’s Sierra Nevada mountains. It ranges from Reno to Interstate 15 north of San Bernardino. It isn’t what people think of when they hear “California”; not only are there no beaches, there aren’t very many people. Formerly a true blue-line two lane highway, 395 breaks into 4 lanes now and then but it normally isn’t very busy, except when the ski bunnies escape LA and head for the slopes at Mammoth. South of Bishop, well beyond the cutoff to the Bristlecone Pine forest, is the town of Lone Pine. This is a hot spot for camera nuts, off road enthusiasts, hikers, western movie fans, history buffs, tree-huggers and tree cutters alike. It’s also the center of the Owens River Valley, which once was a blossoming agricultural center until Los Angeles bought it and killed it off. Seriously. In far fewer words than the story deserves, here’s what happened: In the early 1900s Los Angeles developers quietly began buying water rights and all the land they could in the Owens Valley and the mountains around it. Los Angeles politicians formed the The Bureau of Los Angeles Aqueduct, which later became the LA Department of Water and Power. The Bureau obtained the water rights from the developers, then built a canal and shipped the water south. The farmland dried up and blew away, the stores and businesses built to support the farms closed, and the people who lost their livelihood moved away. The city agency also started to drain Mono and Owens Lakes, and only allowed some water to stay in these lakes after some very bitter lawsuits. But that’s just one of the stories of heartbreak in the Owens Valley. North of Lone Pine is the ‘War Relocation Center’ at Manzanar. During World War II, our forefathers made their Japanese neighbors stay here for the duration of the war. It was a prison camp, a very large one, and while our Japanese citizens were not treated badly, they were not allowed to leave, either. The camp has a visitor center and a self-guided tour. However, not every history lesson here is depressing. West of Lone Pine, the Alabama Hills are historical in so many ways, just visiting them makes one smarter. Their geological history is unique–the rock formations are granite, just like the Sierras a few miles to the west, but they look very different because they were formed differently. 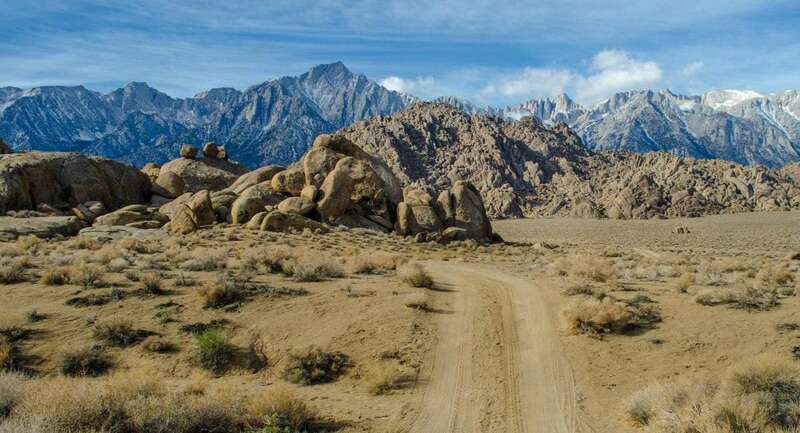 Numerous roads and trails cut through the Alabama Hills, some of which are navigable by a family sedan, others calling for a high clearance four wheel drive. Photograph by Len Wilcox. According to the Bureau of Land Management, the hills were eroded by chemical weathering. When the hills were still covered with soil, percolating water rounded the granite blocks and sculpted them into the formations we see today. But that occurred over the last 100 million years. In more recent history–say, the last 10,000 years–these hills were a holy place to the natives. There is extensive evidence of burial sites and locations used for religious rituals, some still used by members of the modern day Paiute tribe that is headquartered in Lone Pine. In the mid-1800s, the European settlements from Eastern America rushed California and the entire Mojave was overrun with gold seekers. In the late 1800s more people lived on the central Mojave than live there now. Then, this was the land of dreams and sudden riches, of con games and get-rich-quick schemes as well as the gut-busting labor of hard-rock mining. These mountains and flats were the subject of the dreams and schemes of the Rainbow Chasers, that curious motley group of men and women who came here to the Mojave to get rich but stayed to find their souls. With their single-blanket rolls and mules for companions, they wandered this vast desert in pursuit of gold and silver, but sometimes even if they found it they stayed because the Mojave had taken them over. Lone Pine was a beehive of activity at this time. There were many other towns on the Mojave then, but most have faded to dust. Lone Pine remains in part because another group of crazy Americans discovered it in the 1920s: Hollywood and the movie industry. Over 400 movies have been filmed here, mostly westerns, and countless TV commercials. If you watch TV or movies, you’ve seen this area so much you’ll instantly feel at home when you go exploring. The town celebrates its movie heritage, of course, with restaurant walls covered in autographed photos of celebrities and movie star names for their food. For all that, the meals are good and the prices are reasonable. 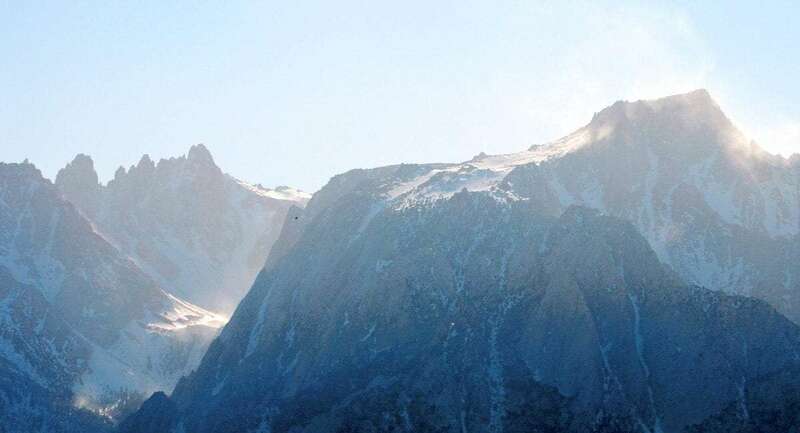 And, by the way, the pinnacled mountain due west of town is Mount Whitney, the highest point in the lower 48 states. Mt. Whitney in the distance, the tallest point in the Contiguous United States. Photograph by Nathan. 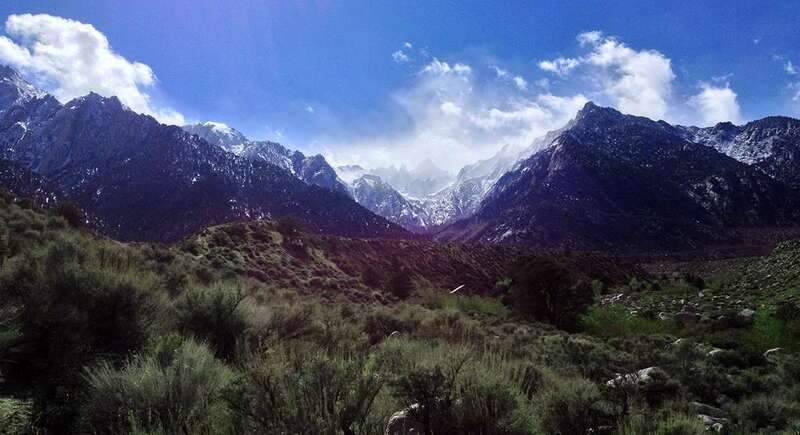 As awesome as Lone Pine and its surroundings are, there’s so much more to the 395 saga. Heading south is Owens Lake, and the road divides with a branch heading east to Death Valley and another southward to Ridgecrest. Traveling through this area, it may not look like much, but there must be incredible value here. It is one of the most protected zones on earth: hundreds of square miles, practically inhospitable by nature and now by law to human habitation. The area includes Death Valley, Kings Canyon, Sequoia, and Yosemite National Parks, and several preserves or designated wilderness or natural areas. While Highway 395 doesn’t directly touch all of these sanctuaries it is a major artery that delivers people and goods to and from them, or is within sight of the parks. We cover the Giant Sequoias in this issue, too. Read all about the largest living organisms on earth. These park lands are tens of thousands of acres in permanent reserve. They are protected from the effects of human progress and development. And much more of this land is protected in other, less permanent ways. Much of the area around Ridgecrest is a military reservation. Tanks and troops practice their war games at Fort Irwin; while this is inherently dangerous to humans and there is some environmental impact, it could be (and is) argued that the military maneuvers take up only a small portion of land that is otherwise kept wild and free. Likewise, China Lake is a huge area which the Navy uses for training its jet fighter pilots. (If the jets stayed on the military reservation, that might be all right; but all too often, you’ll be on an empty desert trail, enjoying the peace and emptiness of desert wilderness, and a Navy fighter comes rolling along at near-Mach speed just above your head. Take note, Navy: this is not conducive to good heart health or proper sanitation.). The rest of the land is protected from development in other ways. As mentioned earlier, the city of Los Angeles locked up the land and threw away the key in the last century by buying up water rights and building a canal to send the water south. What used to be farm land is now desert, returned to its pre-development state, sold out and gone. It is land that cannot be developed even if it can be bought; the water that passes through it is owned by the city of LA. The Sierras are one of the reasons it’s so dry here: cloud cover, and the ensuing rainfall, has a very hard time making it over the mountains. Photograph by Len Wilcox. I confess: I rather like that this land will remain undeveloped for many lifetimes ahead. I like it because traveling 395 isn’t only an experience, it is a state of mind. It’s the state of mind that allows a person to see not just the dry desolate wasteland but a land of color, energy and hidden mystery. It’s the state of mind that lets a person find comfort instead of fear when facing the empty land, the absolute lack of civilized amenities. It’s the state of mind that tells you, ‘You can die out here’, and you know it is true but you’re not afraid. It is a good feeling. It’s a challenge, but also rightness. It is a primordial challenge that my children’s children will need. And maybe some of those hidden discoveries that I found will still be here for them to find on their own 395 journey. So, if you go, travel safely, read and heed the warnings about desert travel, bring water and your camera, and open your eyes, heart and mind. Watch for those hidden mysteries and listen to the stories. Be wise and careful and you’ll be back. Take your time–Mojave time. See you there. Len is an agriculture, environment, and travel writer from central California who has written extensively about the Mojave desert.